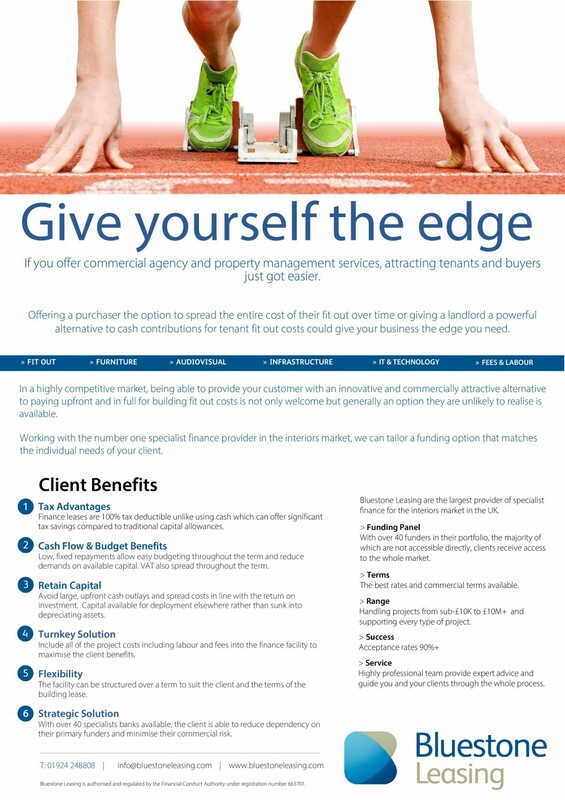 If you offer commercial agency and property management services, attracting tenants and buyers just got easier. Offering a purchaser the option to spread the entire cost of their fit out over time or giving a landlord a powerful alternative to cash contributions for tenant fit out costs could give your business the edge you need. Have you made a purchase in the last three, six or 12months without taking advantage of the benefits of leasing? If you have made a purchase within the last three, six or 12 months; or potentially even longer for larger equipment and machinery, and paid cash you can still take advantage of the many benefits available to you by using leasing. Bluestone Leasing can arrange a sale and leaseback solution for you, allowing you to carry on using the asset whilst freeing up the capital to deploy elsewhere and work for you. Alternatively if you have any planned capital expenditure for this year, Bluestone Leasing can offer you a payment option that will allow you to retain the cash for use elsewhere, unlock great tax benefits and spread costs in line with your return on investment. If you are a customer wishing to discuss leasing options further give the Bluestone Leasing team a ring today on 01924 248812. Are you considering upgrading, renewing or growing your software estate? Would a large outlay of cash have a detrimental effect on the cash flow of your business? Then Bluestone Leasing can help. We are software finance specialists and with our panel of over 40 funders you can be certain we will secure you the best terms available. Security – Symantec, ESET, Sophos, etc. What about Consultancy costs? Professional services? Don’t worry, we understand that software deployments, like other IT projects, can often include a proportion of service costs. We can wrap all of your project costs into one facility – complete funding for your entire expenditure. Tax Savings – Finance lease agreements are highly tax-efficient; meaning the repayments (including any interest) are 100% tax deductible. Fixed Costs – Your costs are fixed for the entire term, and the VAT is spread too, meaning no large capital outlay. Why pay in full, up-front for something that will return its value over time? Strategic Approach – Using a finance solution allows you to adopt a strategic approach to your software investments moving forward, treating your costs more like a managed service than a large, and often ad hoc, capital outlay. So, if you’re a customer wishing to discuss a project, or you are a partner wishing to offer your customers a powerful alternative to paying cash for software and IT contact Bluestone Leasing on 01924 248811.